Its empirical formula is C 17 H 25 N 3 O 2 S-C 4 H 6 O 5 , representing a molecular weight of 469.56. Almotriptan is a white to slightly yellow crystalline powder that is soluble in water. AXERT® for oral administration contains almotriptan malate equivalent to 6.25 or 12.5 mg of almotriptan. Each compressed tablet contains the following inactive ingredients: mannitol, cellulose, povidone, sodium starch glycolate, sodium stearyl fumarate, titanium dioxide, hypromellose, polyethylene glycol, propylene glycol, iron oxide (6.25 mg only), FD&C Blue No. 2 (12.5 mg only), and carnauba wax. Almotriptan binds with high affinity to 5-HT 1D , 5-HT 1B , and 5-HT 1F receptors. Almotriptan has weak affinity for 5-HT 1A and 5-HT 7 receptors, but has no significant affinity or pharmacological activity at 5-HT 2 , 5-HT 3 , 5-HT 4 , 5-HT 6 ; alpha or beta adrenergic; adenosine (A 1 , A 2 ); angiotensin (AT 1 , AT 2 ); dopamine (D 1 , D 2 ); endothelin (ET A , ET B ); or tachykinin (NK 1 , NK 2 , NK 3 ) binding sites. Current theories on the etiology of migraine headache suggest that symptoms are due to local cranial vasodilatation and/or to the release of vasoactive and pro-inflammatory peptides from sensory nerve endings in an activated trigeminal system. The therapeutic activity of almotriptan in migraine can most likely be attributed to agonist effects at 5-HT 1B/1D receptors on the extracerebral, intracranial blood vessels that become dilated during a migraine attack, and on nerve terminals in the trigeminal system. Activation of these receptors results in cranial vessel constriction, inhibition of neuropeptide release, and reduced transmission in trigeminal pain pathways. Almotriptan is well absorbed after oral administration (absolute bioavailability about 70%) with peak plasma levels 1 to 3 hours after administration; food does not affect pharmacokinetics. Almotriptan has a mean half-life of 3 to 4 hours. It is eliminated primarily by renal excretion (about 75% of the oral dose). Almotriptan is minimally protein bound (approximately 35%) and the mean apparent volume of distribution is approximately 180 to 200 liters. Almotriptan is metabolized by one minor and two major pathways. Monoamine oxidase (MAO)-mediated oxidative deamination (approximately 27% of the dose), and cytochrome P450-mediated oxidation (approximately 12% of the dose) are the major routes of metabolism, while flavin monooxygenase is the minor route. MAO-A is responsible for the formation of the indoleacetic acid metabolite, whereas cytochrome P450 (3A4 and 2D6) catalyzes the hydroxylation of the pyrrolidine ring to an intermediate that is further oxidized by aldehyde dehydrogenase to the gamma-aminobutyric acid derivative. Both metabolites are inactive. Approximately 40% of an administered dose is excreted unchanged in urine. Renal clearance exceeds the glomerular filtration rate by approximately 3-fold, indicating an active mechanism. Approximately 13% of the administered dose is excreted via feces, both unchanged and metabolized. Renal and total clearance, and amount of drug excreted in the urine were lower in elderly healthy volunteers (age 65 to 76 years) than in younger healthy volunteers (age 19 to 34 years), resulting in longer terminal half-life (3.7 h vs. 3.2 h) and a 25% higher area under the plasma concentration-time curve in the elderly subjects. The differences, however, do not appear to be clinically significant. The pharmacokinetics of almotriptan in pediatric patients have not been evaluated. No significant gender differences have been observed in pharmacokinetic parameters. No significant differences have been observed in pharmacokinetic parameters between Caucasian and African-American volunteers. The pharmacokinetics of almotriptan have not been assessed in this population. Based on the known mechanisms of clearance of almotriptan, the maximum decrease expected in almotriptan clearance due to hepatic impairment would be 60% (see DOSAGE AND ADMINISTRATION ). The clearance of almotriptan was approximately 65% lower in patients with severe renal impairment (Cl/F=19.8 L/h; creatinine clearance between 10 and 30 mL/min) and approximately 40% lower in patients with moderate renal impairment (Cl/F=34.2 L/h; creatinine clearance between 31 and 71 mL/min) than in healthy volunteers (Cl/F=57 L/h). Maximal plasma concentrations of almotriptan increased by approximately 80% in these patients (see DOSAGE AND ADMINISTRATION ). All drug interaction studies were performed in healthy volunteers using a single 12.5 mg dose of almotriptan and multiple doses of the other drug. Coadministration of almotriptan and moclobemide (150 mg b.i.d. for 8 days) resulted in a 27% decrease in almotriptan clearance. Coadministration of almotriptan and propranolol (80 mg b.i.d. for 7 days) resulted in no significant changes in the pharmacokinetics of almotriptan. Coadministration of almotriptan and fluoxetine (60 mg daily for 8 days), a potent inhibitor of CYP4502D6, had no effect on almotriptan clearance, but maximal concentrations of almotriptan were increased 18%. This difference is not clinically significant. Coadministration of almotriptan and verapamil (120 mg sustained release tablets b.i.d. for 7 days), an inhibitor of CYP3A4, resulted in a 20% increase in the area under the plasma concentration-time curve, and in a 24% increase in maximal plasma concentrations of almotriptan. Neither of these changes is clinically significant. Coadministration of almotriptan and the potent CYP3A4 inhibitor ketoconazole (400 mg qd for 3 days) resulted in an approximately 60% increase in the area under the plasma concentration-time curve and maximal plasma concentrations of almotriptan. Although the interaction between almotriptan and other potent CYP3A4 inhibitors ( e.g., itraconazole, ritonavir, and erythromycin) has not been studied, increased exposures to almotriptan may be expected when almotriptan is used concomitantly with these medications. The efficacy of AXERT® (almotriptan malate) Tablets was established in 3 multi-center, randomized, double-blind, placebo-controlled European trials. Patients enrolled in these studies were primarily female (86%) and Caucasian (more than 98%), with a mean age of 41 years (range of 18 to 72). Patients were instructed to treat a moderate to severe migraine headache. Two hours after taking one dose of study medication, patients evaluated their headache pain. If the pain had not decreased in severity to mild or to no pain, the patient was allowed to take an escape medication. If the pain had decreased to mild or to no pain at 2 hours but subsequently increased in severity between 2 and 24 hours, it was considered a relapse and the patient was instructed to take a second dose of study medication. Associated symptoms of nausea, vomiting, photophobia, and phonophobia were also evaluated. In these studies, the percentage of patients achieving a response (mild or no pain) 2 hours after treatment was significantly greater in patients who received either AXERT® 6.25 mg or 12.5 mg, compared with those who received placebo. A higher percentage of patients reported pain relief after treatment with the 12.5 mg dose than with the 6.25 mg dose. Doses greater than 12.5 mg did not lead to significantly better response. These results are summarized in Table 1. These results cannot be validly compared with results of anti-migraine treatments in other studies. Because studies are conducted at different times, with different samples of patients, by different investigators, employing different criteria and/or different interpretations of the same criteria, under different conditions (dose, dosing regimen, etc. ), quantitative estimates of treatment responses and the timing of response may be expected to vary considerably from study to study. 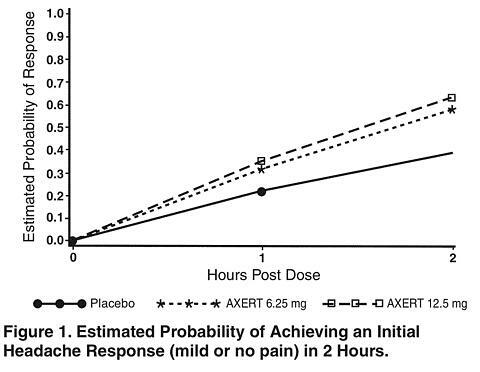 The estimated probability of achieving pain relief within 2 hours following initial treatment with AXERT® is shown in Figure 1. This Kaplan-Meier plot is based on data obtained in the three placebo-controlled clinical trials that provided evidence of efficacy (Studies 1, 2, and 3). Patients not achieving pain relief by 2 hours were censored at 2 hours. For patients with migraine-associated photophobia, phonophobia, nausea, and vomiting at baseline, there was a decreased incidence of these symptoms following administration of AXERT® compared with placebo. Two to 24 hours following the initial dose of study medication, patients were allowed to take an escape medication or a second dose of study medication for pain response. The estimated probability of patients taking escape medication or a second dose of study medication over the 24 hours following the initial dose of study medication is shown in Figure 2. This Kaplan-Meier plot is based on data obtained in the three placebo-controlled trials that provided evidence of efficacy (Studies 1, 2, and 3). Patients not using additional treatment were censored at 24 hours. Remedication was not allowed within 2 hours after the initial dose of AXERT®. The efficacy of AXERT® was unaffected by the presence of aura; by gender, weight, or age of the patient; or by concomitant use of common migraine prophylactic drugs (e.g., beta-blockers, calcium channel blockers, tricyclic antidepressants), or oral contraceptives. There were insufficient data to assess the effect of race on efficacy. AXERT® (almotriptan malate) Tablets are indicated for the acute treatment of migraine with or without aura in adults. AXERT® is not intended for the prophylactic therapy of migraine or for use in the management of hemiplegic or basilar migraine (see CONTRAINDICATIONS ). Safety and effectiveness of AXERT® have not been established for cluster headache, which is present in an older, predominantly male population. AXERT® (almotriptan malate) Tablets should not be given to patients with ischemic heart disease (angina pectoris, history of myocardial infarction, or documented silent ischemia), or to patients who have symptoms or findings consistent with ischemic heart disease, coronary artery vasospasm, including Prinzmetal's variant angina, or other significant underlying cardiovascular disease (see WARNINGS ). Because AXERT® may increase blood pressure, it should not be given to patients with uncontrolled hypertension (see WARNINGS ). 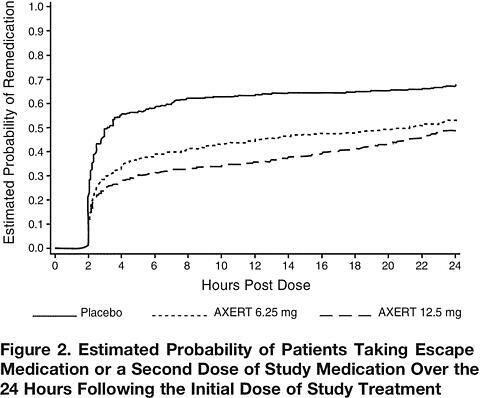 AXERT® should not be administered within 24 hours of treatment with another 5-HT 1 agonist, or an ergotamine-containing or ergot-type medication like dihydroergotamine or methysergide. AXERT® should not be given to patients with hemiplegic or basilar migraine. AXERT® is contraindicated in patients who are hypersensitive to almotriptan or any of its ingredients. AXERT® (almotriptan malate) Tablets should only be used where a clear diagnosis of migraine has been established. Because of the potential of this class of compounds (5-HT 1B/1D agonists) to cause coronary vasospasm, AXERT® should not be given to patients with documented ischemic or vasospastic coronary artery disease (see CONTRAINDICATIONS ). It is strongly recommended that 5-HT 1 agonists (including AXERT®) not be given to patients in whom unrecognized coronary artery disease (CAD) is predicted by the presence of risk factors ( e.g., hypertension, hypercholesterolemia, smoker, obesity, diabetes, strong family history of CAD, female with surgical or physiological menopause, or male over 40 years of age) unless a cardiovascular evaluation provides satisfactory clinical evidence that the patient is reasonably free of coronary artery and ischemic myocardial disease or other significant underlying cardiovascular disease. The sensitivity of cardiac diagnostic procedures to detect cardiovascular diseases or predisposition to coronary artery vasospasm is modest at best. If, during the cardiovascular evaluation, the patient's medical history, electrocardiogram (ECG), or other investigations reveal findings indicative of, or consistent with, coronary artery vasospasm or myocardial ischemia, AXERT® should not be administered (see CONTRAINDICATIONS ). For patients with risk factors predictive of CAD, who are determined to have a satisfactory cardiovascular evaluation, it is strongly recommended that administration of the first dose of AXERT® take place in the setting of a physician's office or similar medically staffed and equipped facility, unless the patient has previously received almotriptan. Because cardiac ischemia can occur in the absence of clinical symptoms, consideration should be given to obtaining an ECG during the interval immediately following the first use of AXERT® in a patient with risk factors. It is recommended that patients who are intermittent long-term users of AXERT® and who have or acquire risk factors predictive of CAD, as described above, undergo periodic interval cardiovascular evaluation as they continue to use AXERT®. The systematic approach described above is intended to reduce the likelihood that patients with unrecognized cardiovascular disease will be inadvertently exposed to AXERT®. Serious adverse cardiac events, including acute myocardial infarction, have been reported within a few hours following administration of almotriptan. Life-threatening disturbances of cardiac rhythm and death have been reported within a few hours following the administration of other 5-HT 1 agonists. Considering the extent of use of 5-HT 1 agonists in patients with migraine, the incidence of these events is extremely low. AXERT® can cause coronary vasospasm; at least one of these events occurred in a patient with no cardiac history and with documented absence of coronary artery disease. Because of the close proximity of the events to use of AXERT®, a causal relationship cannot be excluded. Among the 3865 subjects/patients who received AXERT® in premarketing clinical trials, one patient was hospitalized for observation after a scheduled ECG was found to be abnormal (negative T-waves on the left leads) 48 hours after taking a single 6.25 mg dose of almotriptan. The patient, a 48-year-old female, had previously taken 3 other doses for earlier migraine attacks. Myocardial enzymes at the time of the abnormal ECG were normal. The patient was diagnosed as having had myocardial ischemia, and it was also found that she had a family history of coronary disease. An ECG performed 2 days later was normal, as was a follow-up coronary angiography. The patient recovered without incident. Serious cardiovascular events have been reported in association with the use of AXERT®. The uncontrolled nature of postmarketing surveillance, however, makes it impossible to definitively determine the proportion of the reported cases that were actually caused by almotriptan or to reliably assess causation in individual cases. Cerebral hemorrhage, subarachnoid hemorrhage, stroke, and other cerebrovascular events have been reported in patients treated with other 5-HT 1 agonists, and some have resulted in fatalities. In a number of cases, it appears possible that the cerebrovascular events were primary, the agonist having been administered in the incorrect belief that the symptoms experienced were a consequence of migraine, when they were not. It should be noted that patients with migraine may be at increased risk of certain cerebrovascular events ( e.g., stroke, hemorrhage, transient ischemic attack). 5-HT 1 agonists may cause vasospastic reactions other than coronary artery vasospasm. Both peripheral vascular ischemia and colonic ischemia with abdominal pain and bloody diarrhea have been reported with 5-HT 1 agonists. Significant elevations in systemic blood pressure, including hypertensive crisis, have been reported on rare occasions in patients with and without a history of hypertension treated with other 5-HT 1 agonists. AXERT® is contraindicated in patients with uncontrolled hypertension (see CONTRAINDICATIONS ). In volunteers, small increases in mean systolic and diastolic blood pressure relative to placebo were seen over the first 4 hours after administration of 12.5 mg of almotriptan (0.21 and 1.35 mm Hg, respectively). The effect of almotriptan on blood pressure was also assessed in patients with hypertension controlled by medication. In this population, mean increases in systolic and diastolic blood pressure relative to placebo over the first 4 hours after administration of 12.5 mg of almotriptan were 4.87 and 0.26 mm Hg, respectively. The slight increases in blood pressure in both volunteers and controlled hypertensive patients were not considered clinically significant. An 18% increase in mean pulmonary artery pressure was seen following dosing with another 5-HT 1 agonist in a study evaluating subjects undergoing cardiac catheterization. As with other 5-HT 1B/1D agonists, sensations of tightness, pain, pressure, and heaviness in the precordium, throat, neck, and jaw have been reported after treatment with AXERT® (almotriptan malate) Tablets. These events have not been associated with arrhythmias or ischemic ECG changes in clinical trials. Because drugs in this class, including almotriptan, may cause coronary artery vasospasm, patients who experience signs or symptoms suggestive of angina following dosing should be evaluated for the presence of CAD or a predisposition to Prinzmetal's variant angina before receiving additional doses of medication, and should be monitored electrocardiographically if dosing is resumed and similar symptoms recur. Similarly, patients who experience other symptoms or signs suggestive of decreased arterial flow, such as ischemic bowel syndrome or Raynaud's syndrome following the use of any 5-HT 1 agonist are candidates for further evaluation (see WARNINGS ). AXERT® should also be administered with caution to patients with diseases that may alter the absorption, metabolism, or excretion of drugs, such as those with impaired hepatic or renal function (see CLINICAL PHARMACOLOGY , Special Populations ). For a given attack, if a patient does not respond to the first dose of AXERT®, the diagnosis of migraine headache should be reconsidered before the administration of a second dose. When pigmented rats were given a single oral dose of 5 mg/kg of radiolabeled almotriptan, the elimination half-life of radioactivity from the eye was 22 days. This finding suggests that almotriptan and/or its metabolites may bind to the melanin of the eye. Because almotriptan could accumulate in melanin-rich tissues over time, there is the possibility that it could cause toxicity in these tissues over extended use. However, no adverse retinal effects related to treatment with almotriptan were noted in a 52-week toxicity study in dogs given up to 12.5 mg/kg/day (resulting in systemic exposure [plasma AUC] to parent drug approximately 20 times that in humans receiving the maximum recommended daily dose of 25 mg). Although no systematic monitoring of ophthalmologic function was undertaken in clinical trials, and no specific recommendations for ophthalmologic monitoring are offered, prescribers should be aware of the possibility of long-term ophthalmologic effects. Three male dogs (out of a total of 14 treated) in a 52-week toxicity study of oral almotriptan developed slight corneal opacities that were noted after 51, but not after 25 weeks of treatment. The doses at which this occurred were 2, 5, and 12.5 mg/kg/day. The opacity reversed in the affected dog at 12.5 mg/kg/day after a 4-week drug-free period. Systemic exposure (plasma AUC) to parent drug at 2 mg/kg/day was approximately 2.5 times the exposure in humans receiving the maximum recommended daily dose of 25 mg. A no-effect dose was not established. See PATIENT INFORMATION at the end of this labeling for the text of the separate leaflet provided for patients. No specific laboratory tests are recommended for monitoring patients. These drugs have been reported to cause prolonged vasospastic reactions. Because there is a theoretical basis that these effects may be additive, use of ergotamine-containing or ergot-type medications (like dihydroergotamine or methysergide) and AXERT® within 24 hours of each other should be avoided (see CONTRAINDICATIONS ). Coadministration of moclobemide resulted in a 27% decrease in almotriptan clearance and an increase in C max of approximately 6%. No dose adjustment is necessary. Concomitant use of other 5-HT 1B/1D agonists within 24 hours of treatment with AXERT® is contraindicated (see CONTRAINDICATIONS ). The pharmacokinetics of almotriptan were not affected by coadministration of propranolol. SSRIs ( e.g., fluoxetine, fluvoxamine, paroxetine, sertraline) have been rarely reported to cause weakness, hyperreflexia, and incoordination when coadministered with 5-HT 1 agonists. If concomitant treatment with AXERT® and an SSRI is clinically warranted, appropriate observation of the patient is advised. Coadministration of almotriptan and verapamil resulted in a 24% increase in plasma concentrations of almotriptan. No dose adjustment is necessary. Coadministration of almotriptan and the potent CYP3A4 inhibitor ketoconazole (400 mg q.d. for 3 days) resulted in an approximately 60% increase in the area under the plasma concentration-time curve and maximal plasma concentrations of almotriptan. Although the interaction between almotriptan and other potent CYP3A4 inhibitors ( e.g., itraconazole, ritonavir, and erythromycin) has not been studied, increased exposures to almotriptan may be expected when almotriptan is used concomitantly with these medications. AXERT® is not known to interfere with commonly employed clinical laboratory tests. The carcinogenic potential of almotriptan was evaluated by oral gavage for up to 103 weeks in mice at doses up to 250 mg/kg/day and in rats for up to 104 weeks at doses up to 75 mg/kg/day. These doses were associated with plasma exposures (AUC) to parent drug that were approximately 40 and 78 times, in mice and rats respectively, the plasma AUC observed in humans receiving the maximum recommended daily dose (MRDD) of 25 mg. Because of high mortality rates in both studies, which reached statistical significance in high dose female mice, all female rats, all male mice, and high dose female mice were terminated between weeks 96 and 98. There was no increase in tumors related to almotriptan administration. Almotriptan was not mutagenic, with or without metabolic activation, in two in vitro gene mutation assays, the Ames test and the thymidine locus mouse lymphoma assay. Almotriptan was not clastogenic in an in vivo mouse micronucleus assay. Almotriptan produced an equivocal weakly positive response in in vitro cytogenetics assays in human lymphocytes. When female rats received almotriptan by oral gavage prior to and during mating and up to implantation at doses of 25, 100, and 400 mg/kg/day, prolongation of the estrous cycle was observed at a dose of 100 mg/kg/day (40 times the maximum recommended daily dose [MRDD] of 25 mg on a mg/m 2 basis). No effects on fertility were noted in female rats at 25 mg/kg/day (approximately 10 times the MRDD on a mg/m 2 basis). When almotriptan was administered by oral gavage to pregnant rats throughout the period of organogenesis at doses of 125, 250, 500, and 1000 mg/kg/day, an increase in embryolethality was seen at the highest dose (maternal exposure, based on plasma AUC of parent drug, was approximately 958 times the human exposure at the maximum recommended daily dose [MRDD] of 25 mg). Increased incidences of fetal skeletal variations (decreased ossification) were noted at doses greater than 125 mg/kg/day (maternal exposure 80 times human exposure at MRDD). Similar studies in rabbits conducted with almotriptan at doses of 5, 20, and 60 mg/kg/day demonstrated increases in embryolethality at the high dose (50 times the MRDD on a mg/m2 basis). When almotriptan was administered to rats throughout the periods of gestation and lactation at doses of 25, 100, and 400 mg/kg/day, gestation length was increased and litter size and offspring body weight were decreased at the high dose (160 times the MRDD on a mg/m 2 basis). The decrease in pup weight persisted throughout lactation. The no-observed-effect level in this study was 100 mg/kg/day (40 times the MRDD on a mg/m 2 basis). There are no adequate and well-controlled studies in pregnant women; therefore, AXERT® should be used during pregnancy only if the potential benefit justifies the potential risk to the fetus. It is not known whether almotriptan is excreted in human milk. Because many drugs are excreted in human milk, caution should be exercised when AXERT® is administered to a nursing woman. Lactating rats dosed with almotriptan had milk levels equivalent to maternal plasma levels at 0.5 hours and 7 times higher than plasma levels at 6 hours after dosing. Safety and effectiveness of AXERT® in pediatric patients have not been established; therefore, AXERT® is not recommended for use in patients under 18 years of age. Postmarketing experience with other triptans include a limited number of reports that describe pediatric patients who have experienced clinically serious adverse events that are similar in nature to those reported rarely in adults. The long-term safety of almotriptan in pediatric patients has not been studied. Clinical studies of AXERT® did not include sufficient numbers of subjects aged 65 and over to determine whether they respond differently from younger subjects. Clearance of almotriptan was lower in elderly volunteers than in younger individuals, but there were no observed differences in the safety and tolerability between the two populations (see CLINICAL PHARMACOLOGY , Special Populations ). In general, dose selection for an elderly patient should be cautious, usually starting at the low end of the dosing range, reflecting the greater frequency of decreased hepatic, renal, or cardiac function, and of concomitant disease or other drug therapy. The recommended dose of AXERT® for elderly patients with normal renal function for their age is the same as that recommended for younger adults. Serious cardiac events, including myocardial infarction and coronary artery vasospasm, have occurred following the use of AXERT® (almotriptan malate) Tablets. These events are extremely rare and most have been reported in patients with risk factors predictive of CAD. Events reported in association with drugs in this class have included coronary artery vasospasm, transient myocardial ischemia, myocardial infarction, ventricular tachycardia, and ventricular fibrillation (see CONTRAINDICATIONS , WARNINGS , and PRECAUTIONS ). Adverse events were assessed in controlled clinical trials that included 1840 patients who received one or two doses of AXERT® and 386 patients who received placebo. The most common adverse events during treatment with AXERT® were nausea, somnolence, headache, paresthesia, and dry mouth. In long-term open-label studies where patients were allowed to treat multiple attacks for up to one year, 5% (63 out of 1347 patients) withdrew due to adverse experiences. Table 2 lists the adverse events that occurred in at least 1% of the patients treated with AXERT®, and at an incidence greater than in patients treated with placebo, regardless of drug relationship. These events reflect experience gained under closely monitored conditions of clinical trials in a highly selected patient population. In actual clinical practice or in other clinical trials, these frequency estimates may not apply, as the conditions of use, reporting behavior, and the kinds of patients treated may differ. AXERT® is generally well tolerated. Most adverse events were mild in intensity and were transient, and did not lead to long-lasting effects. The incidence of adverse events in controlled clinical trials was not affected by gender, weight, age, presence of aura, or use of prophylactic medications or oral contraceptives. There were insufficient data to assess the effect of race on the incidence of adverse events. In this section, the frequencies of less commonly reported adverse events are presented. However, the role of AXERT® in their causation cannot be reliably determined. Furthermore, variability associated with adverse event reporting, the terminology used to describe adverse events, etc., limit the value of the quantitative frequency estimates provided. Event frequencies are calculated as the number of patients who used AXERT® in controlled clinical trials and reported an event, divided by the total number of patients exposed to AXERT® in these studies. All reported events are included, except the ones already listed in the previous table, those unlikely to be drug-related, and those poorly characterized. Events are further classified within body system categories and enumerated in order of decreasing frequency using the following definitions: frequent adverse events are those occurring in at least 1/100 patients; infrequent adverse events are those occurring in 1/100 to 1/1000 patients; and rare adverse events are those occurring in fewer than 1/1000 patients. Body: Frequent: headache. Infrequent: abdominal cramp or pain, asthenia, chills, back pain, chest pain, neck pain, fatigue, and rigid neck. Rare: fever and photosensitivity reaction. Cardiovascular: Infrequent: vasodilation, palpitations, and tachycardia. Rare: hypertension and syncope. Digestive: Infrequent: diarrhea, vomiting, and dyspepsia. Rare: colitis, gastritis, gastroenteritis, esophageal reflux, increased thirst, and increased salivation. Metabolic: Infrequent: hyperglycemia and increased serum creatine phosphokinase. Rare: increased gamma glutamyl transpeptidase and hypercholesteremia. Musculo-Skeletal: Infrequent: myalgia and muscular weakness. Rare: arthralgia, arthritis, and myopathy. Nervous: Frequent: dizziness and somnolence. Infrequent: tremor, vertigo, anxiety, hypesthesia, restlessness, CNS stimulation, insomnia, and shakiness. Rare: change in dreams, impaired concentration, abnormal coordination, depressive symptoms, euphoria, hyperreflexia, hypertonia, nervousness, neuropathy, nightmares, and nystagmus. Respiratory: Infrequent: pharyngitis, rhinitis, dyspnea, laryngismus, sinusitis, bronchitis, and epistaxis. Rare: hyperventilation, laryngitis, and sneezing. Skin: Infrequent: diaphoresis, dermatitis, erythema, pruritus, and rash. Special Senses: Infrequent: ear pain, conjunctivitis, eye irritation, hyperacusis, and taste alteration. Rare: diplopia, dry eyes, eye pain, otitis media, parosmia, scotoma, and tinnitus. The following section enumerates potentially important adverse events that have occurred in clinical practice and that have been reported spontaneously to various surveillance systems. The events enumerated represent reports arising from both domestic and non-domestic use of almotriptan and exclude those events already listed elsewhere as adverse reactions, or those events too general to be informative. Because the reports cite events reported spontaneously from worldwide postmarketing experience, frequency of events and the role of almotriptan in their causation cannot be reliably determined. Cardiovascular: Coronary artery vasospasm, intermediate coronary syndrome, and myocardial infarction. Although the abuse potential of AXERT® (almotriptan malate) Tablets has not been specifically assessed, no abuse of, tolerance to, withdrawal from, or drug-seeking behavior was observed in patients who received AXERT® in clinical trials or their extensions. The 5-HT 1B/1D agonists, as a class, have not been associated with drug abuse. Patients and volunteers receiving single oral doses of 100 to 150 mg of almotriptan did not experience significant adverse events. Six additional normal volunteers received single oral doses of 200 mg without serious adverse events. During clinical trials with AXERT® (almotriptan malate) Tablets, one patient ingested 62.5 mg in a 5-hour period and another patient ingested 100 mg in a 38-hour period. Neither patient experienced adverse reactions. Based on the pharmacology of 5-HT agonists, hypertension or other more serious cardiovascular symptoms could occur after overdosage. Gastrointestinal decontamination ( i.e., gastric lavage followed by activated charcoal) should be considered in patients suspected of an overdose with AXERT®. Clinical and electrocardiographic monitoring should be continued for at least 20 hours, even if clinical symptoms are not observed. It is unknown what effect hemodialysis or peritoneal dialysis has on plasma concentrations of almotriptan. In controlled clinical trials, single doses of 6.25 mg and 12.5 mg of AXERT® (almotriptan malate) Tablets were effective for the acute treatment of migraines in adults, with the 12.5 mg dose tending to be a more effective dose (see CLINICAL STUDIES ). Individuals may vary in response to doses of AXERT®. The choice of dose should therefore be made on an individual basis. If the headache returns, the dose may be repeated after 2 hours, but no more than two doses should be given within a 24-hour period. Controlled trials have not adequately established the effectiveness of a second dose if the initial dose is ineffective. The safety of treating an average of more than four headaches in a 30-day period has not been established. The pharmacokinetics of almotriptan have not been assessed in this population. The maximum decrease expected in the clearance of almotriptan due to hepatic impairment is 60%. Therefore, the maximum daily dose should not exceed 12.5 mg over a 24-hour period, and a starting dose of 6.25 mg should be used (see CLINICAL PHARMACOLOGY , Pharmacokinetics ). In patients with severe renal impairment, the clearance of almotriptan was decreased. Therefore, the maximum daily dose should not exceed 12.5 mg over a 24-hour period, and a starting dose of 6.25 mg should be used (see CLINICAL PHARMACOLOGY , Pharmacokinetics ). 6.25 mg: White, coated, circular, biconvex tablets with red code imprint "2080." 12.5 mg: White, coated, circular, biconvex tablets with blue stylized "A." Please read this information before you start taking AXERT® (almotriptan malate) Tablets. Also, read this leaflet each time you renew your prescription, just in case anything has changed. Remember, this leaflet does not take the place of careful discussions with your doctor. You and your doctor should discuss AXERT® when you start taking your medication and at regular checkups. What is AXERT® and what is it used for? AXERT® is a medication used to treat migraine attacks in adults. AXERT® is a member of a class of drugs called selective serotonin receptor agonists. Use AXERT® only for a migraine attack. Do not use AXERT® to treat headaches that might be caused by other conditions. Tell your doctor about your symptoms. Your doctor will decide if you have migraine. have ever had heart disease. have hemiplegic or basilar migraine. If you are not sure, ask your doctor. have taken another serotonin receptor agonist in the last 24 hours. These include naratriptan (AMERGE®), rizatriptan (MAXALT®), sumatriptan (IMITREX®), or zolmitriptan (ZOMIG®). have taken ergotamine-type medicines in the last 24 hours. These include ergotamine (BELLERGAL-S®, CAFERGOT®, ERGOMAR®, WIGRAINE®), dihydroergotamine (D.H.E. 45®), or methysergide (SANSERT®). had an allergic reaction to AXERT® or any of its ingredients. The active ingredient is almotriptan malate. Ask your doctor or pharmacist about inactive ingredients. monoamine oxidase (MAO) inhibitors, such as phenelzine sulfate (NARDIL®) or tranylcypromine sulfate (PARNATE®) for depression or another condition, or if it has been less than two weeks since you stopped taking an MAO inhibitor. ketoconazole (NIZORAL®), itraconazole (SPORANOX®), ritonavir (NORVIR®), or erythromycin (EMYCIN®), or if it has been less than one week since you stopped taking one of these drugs. past or present medical problems. past or present high blood pressure, chest pain, shortness of breath, or heart disease. you are a male over 40 years old. plans to become pregnant, or if you are pregnant, might be pregnant, or do not use effective birth control. plans to breast-feed, or if you are already breast-feeding. medicines you take or plan to take, including prescription and non-prescription medicines and herbal supplements. Be sure to include medicines you normally take for a migraine. How should I take AXERT®? When you have a migraine headache, take your medicine as directed by your doctor. If your headache comes back after your first dose, you may take a second dose 2 hours or more after the first dose. If your pain continues after the first dose, do not take a second dose without first checking with your doctor. Do not take more than two AXERT® Tablets in a 24-hour period. What should I avoid while taking AXERT®? Check with your doctor before you take any new medicines, including prescription and non-prescription medicines and supplements. There are some medicines that you should not take during the period 24 hours before and 24 hours after taking AXERT®. Some of them are listed in the section " Who should not take AXERT®? " What are the possible side effects of AXERT®? AXERT® is generally well tolerated. The side effects are usually mild and do not last long. The following is not a complete list of side effects. Ask your doctor to tell you about the other side effects. If you experience sleepiness, you should evaluate your ability to perform complex tasks such as driving or operating heavy machinery. Tell your doctor about any other symptoms that you develop while taking AXERT®. If the symptoms continue or worsen, get medical help right away. Also, tell your doctor if you develop a rash or itching after taking AXERT®. You may be allergic to the medicine. In very rare cases, patients taking this class of medicines experience serious heart problems, stroke, or increased blood pressure. Extremely rarely, patients have died. Therefore, tell your doctor right away if you feel tightness, pain, pressure, or heaviness in your chest, throat, neck, or jaw after taking AXERT®. Do not take AXERT® again until your doctor has checked you. A migraine is an intense, throbbing, typically one-sided headache. It often includes nausea, vomiting, sensitivity to light, and sensitivity to sound. The pain and symptoms from a migraine headache may be worse than the pain and symptoms of a common headache. Some people have visual symptoms before the headache, such as flashing lights or wavy lines, called an aura. Migraine attacks typically last for hours or, rarely, for more than a day. They can return often. The strength and frequency of migraine attacks may vary. Migraine headaches tend to occur in members of the same family. Both men and women get migraines, but it is more common in women. Hormone changes in women, such as during monthly menstrual periods. You may be able to prevent migraine attacks or make them come less often if you understand what triggers your attacks. Keeping a headache diary may help you identify and monitor the possible triggers that cause your migraine. Once you identify the triggers, you and your doctor can change your lifestyle to avoid those triggers. How does AXERT® work during a migraine attack? reduces swelling of blood vessels surrounding the brain. This swelling is associated with the headache pain of a migraine attack. It is thought that each of these actions contributes to relief of your symptoms by AXERT®. How should I store AXERT®? Keep your medicine in a safe place where children cannot reach it. It may be harmful to children. Store your medicine away from heat, light, or moisture at a controlled room temperature. If your medicine has expired, throw it away as instructed. If your doctor decides to stop your treatment, do not keep any leftover medicine unless your doctor tells you to do so. Throw away your medicine as instructed. Be sure that discarded tablets are out of the reach of children. Medicines are sometimes prescribed for conditions that are not mentioned in patient information leaflets. Do not use AXERT® for a condition for which it was not prescribed. Do not give AXERT® to other people, even if they have the same symptoms you have. People may be harmed if they take medicines that have not been prescribed for them. This leaflet provides a summary of information about AXERT®. If you have any questions or concerns about either AXERT® or migraines, talk to your doctor. In addition, talk to your pharmacist or other health care provider. * The brands listed are the trademarks of their respective owners and are not trademarks of Ortho-Mcneil Pharmaceutical, Inc. Licensed from: Almirall Prodesfarma, S.A.